Both Christians left for dead; each cites a miracle. JOS, Nigeria (Morning Star News) – Adamu, 28, bears a scar on the back of his neck where two members of the Islamic extremist group Boko Harm tried to slaughter him. A member of the Church of the Brethren in Nigeria (EYN) in Gwoza, Borno state in northeastern Nigeria, Adamu told Morning Star News that in April 2013 he was working on his bean farm in Musari village, in the Mungono area, when a member of the insurgent Boko Haram approached him. Two days later, five other members of Boko Haram showed up. The insurgency is fighting to impose strict sharia (Islamic law) throughout Nigeria. When he refused their order to lie down, they seized him and tied his hands and legs behind his back, he said. “They pinned me down and told me they will make death painful and slow, as they are not prepared to waste their bullets on me,” he said. “They also said they would not give me the honor of slaughtering me by cutting my neck from the front, because that is the way they slaughter their rams. Adamu lay there for days, he said, adding that his survival was miraculous; only later would he learn that the Boko Haram members had threatened to kill anyone in the village who helped him. Though the villagers were afraid to rescue him, eventually a member of his church snuck onto the farm and found him alive, he said. “He went back to the village and mobilized some of our church members who came to the farm and took me away,” Adamu said. They took him to a Christian hospital in Cameroon. Adamu said that before the attack on his farm, Boko Harm destroyed his EYN church building in Musari, and all Christians there fled. Boko Haram and others killed 1,631 Christians in Nigeria for their faith in the first six months of 2014 – a figure that is 91 percent of the total Christians killed in the country in all of last year, according to advocacy group Jubilee Campaign. Last year 1,783 Nigerian Christians were killed for their faith, according to Jubilee Campaign. The increase in Christian deaths this year accompanies an increase in the total number of people killed during the period, mainly by Boko Haram – 4,099, which is 975 more than the total deaths from attacks by religious extremists for all of last year, 3,124, according to Jubilee. Boko Haram violence has increased in number and force since 2009 after it developed ties with Al Qaeda in the Islamic Mahgreb (AQIM). A 29-year-old Christian in Kauri, Borno state who felt the force of Boko Harm weaponry in December 2012 said he would invite his assailants to dine with him. A married father of three children ages 7, 5 and 1, Ayuba (surname withheld) told Morning Star News he has forgiven the gunmen who shot him three times. Ayuba and his wife were working on their farm in the village of Mainari, on the fringes of the Sambisa Forest in Borno state, on Dec. 20, 2012, when he returned to his house to rest. He was surprised to find two motorcycles parked beside his house, he said. “I parked my motorcycle outside the house too, and then went inside, and just then I heard movement outside the house,” he said. 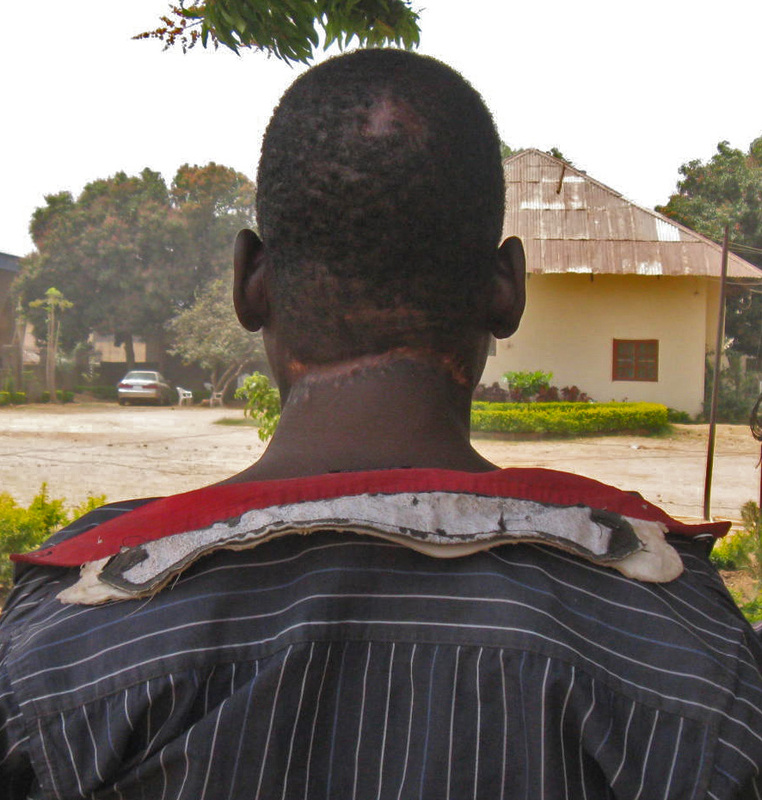 He went out to find two armed Boko Haram members; they asked him his name. When he told them, they asked if it was true that he was a Christian. A member of the Church of Christ in Nations (COCIN), he responded that he was. He then recalled that Muslims in Kauri twice had tried to convert him. They demanded money and the keys to his motorbike. After forcefully taking the keys to his vehicle and removing 35,000 naira (US$212) from his pocket, they told him to lie down because they were going to shoot him, he said. He heard a gunshot, and a bullet pierced his left hand, which he had used to cover his chest, he said. A second shot aimed at his stomach, which he was covering with his right hand. The bullet pierced his right hand. The one who had given the orders angrily cocked his gun and shot at his forehead, he said. The two Boko Haram gunmen took him for dead as they rode away, he said. He asked her to search for help, which did not arrive until five hours later. He had been shot at about 3 p.m., and a neighbor his wife found came to help him at 8 p.m., he said. He was taken first to Kauri, then to General Hospital in Konduga. Doctors treating him there advised that he be taken away lest the Boko Haram gunmen trace him and kill him at the hospital. His wife and other relatives moved him to Adventist Hospital at Kozat, Cameroon, where he remained for three months before going to an undisclosed town. Boko Haram has destroyed his COCIN church building in Kauri, he said, and all Christians there have fled.